Find today's pricing and retail availability for Stringtown Pinot Noir. 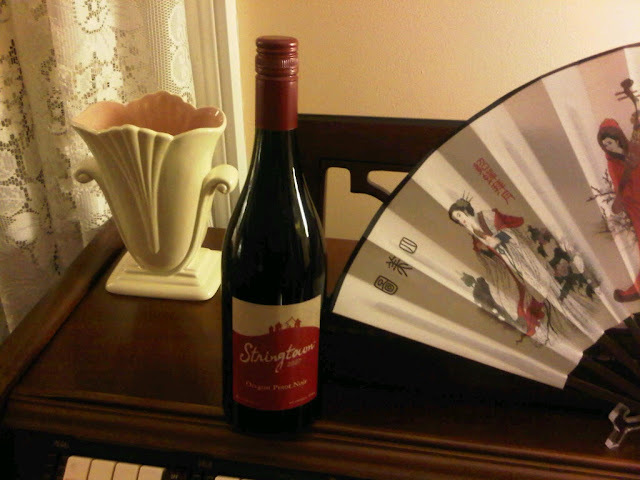 Original Tasting and Review, opening thoughts: The Stringtown Pinot Noir is a wine that I enjoyed quite well in the 2005 vintage. Given the price point on a case purchase, this newer vintage has the of potential being a rare "best value" pinot noir. But let's not put the cart before the wine, so to speak. By way of background, October, 2010: This Oregon pinot noir is finished at 13.5% alcohol, and was bottled by Sherbrooke Cellars in Newberg OR. Inspired by this wine: Sitting in the smoking car, but nice scenery passing by. In the glass: Deep mid-red moving towards opaque in the middle of the glass. On the nose: Poured cool with a brief decant and swirled vigorously, this pinot noir shows a tight, slightly charcoal and chalky nose. There is a hint of sand and a hint of funk, all swirling around tight red berries. Seems like it will be taut - perhaps stingy - on the palate. Not AT ALL like the candy apple red nose of the 2005 version. On the palate: The primary elements on the palate are, in fact, a shade richer and sleeker than expected. The first impression of dryness is followed fairly rapidly by a trickle of fruit, along with solid acids that bring the sip into your cheeks, where it rests for a good while. In summary: Overall, a dry, classic, medium-bodied pinot noir experience. Rates two stars on the five-star Spirit of Wine scale with a plus for a solid, but not repeat, performance. Good value, but not a best value. Updated review, over a year later, November, 2011: Consistent color. The nose is fleshing out some, though still framed in tight oak casing. Mineral, smoky and lightly saline fruit moves onto your palate, with clear unheralded substance and structure. Becomes three stars and a best value because it does beckon you back to see what will become of this youngster. Following long decant, two full days kept cool in partially filled bottle: Fruitier, somewhat raspberry nose. Friendly fruit on the palate, still with that light saline haze and subtle smoke. Living up to the suggestion that more time is doing this well. And even longer decant, two more days, four days total in partial bottle: Finally going over-the-top, more vegetable, broccoli hints. Updated review, another two years later, December, 2013: Bright cherry nose, tiniest hints of vegetable tanginess. Friendly, gentle and lightly sweet and salty on the palate. Still just touching three stars. Updated review, another year later, now seven years from vintage date, December, 2014: Last year's notes are still perfectly relevant.